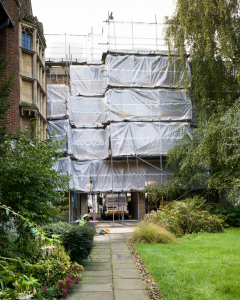 The Wesley House site in Jesus Lane has been emptied for a year while we redevelop the Eastern part to create a new postgraduate college with a focus on International students. 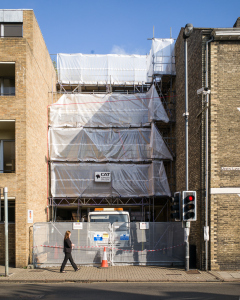 We have decanted to 19a Jesus Lane which is just next door. 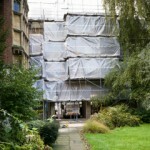 We have split our building work into two stages. 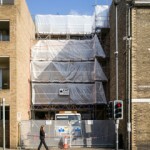 Before we start building, we have “enabling works” to demolish the eastern end of the Rank building. 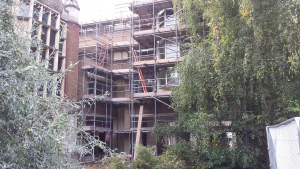 Our contractors Hutton are working with Havering Demolition on this first phase. 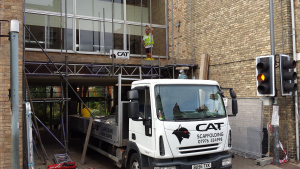 They have been on site since 15th September and the first few weeks have been taken up with erecting scaffolding and clearing the immediate area, including the annoying holly tree at the entrance.